♥ Sweet Glamour Makeup ♥: FASHION CRAVE: PRADA SAFFIANO MINI BAGS! FASHION CRAVE: PRADA SAFFIANO MINI BAGS! OMG,when I saw these bags I almost had a heart attack! 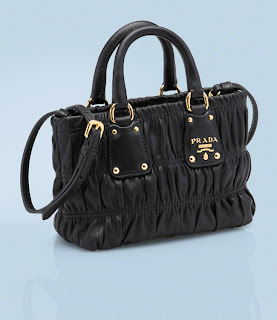 I love smaller bags,and these Prada mini-bags are to die for. What's even more killer-is the price tag. $690..quite a scary price point! It may be justifiable if you could fit more then a phone and compact in it.. It looks so cute though,it is tempting to put this on my Christmas/birthday wishlist! I do have 2 Prada bags now,a mini barrel bag and backpack but are the regular nylon bags aren't as much as the expensive Saffiano exquisite leather. Leather bags last a long time,plus this is a pretty unique bag too! What do you think about mini bags?